Uncanny things begin to happen when you start working with the 72 Angels. Uncanny because they seem to be happening on their own, without your actually doing anything. Timely encounters and conversations, synchronicities and coincidences, little or big "signs" and guidances throughout your day, are how you know something is going on! What is going on is the alchemy of awareness. 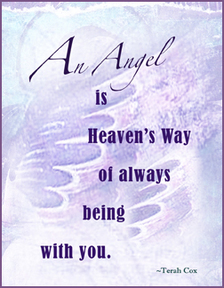 I've come full circle from my beginning days with the 72 Angels, almost 16 years ago, to realize that awareness is the energetic catalyst in working with the 72 Angels. The ancient wisdoms have been telling us about the power of awareness for centuries! It's just that until my work with this tradition -- and particularly in working on the Daily Wisdoms for the Birth Angels Book of Days -- I had never had a tool for practicing awareness on a daily basis with specific aspects of the Divine that are in play in our humanity every moment of our lives. When I was first introduced to the Angelic Kabbalah, I was a little overwhelmed by the depth and complexity of the tradition. Simultaneously, however, I was surprised to realize that just becoming aware of the 72 Angels was beginning to trigger noticeable happenings in my day, as well as subtle energy shifts within me. I was counseled to not be concerned with learning everything there is to learn right away. The most important thing was to be in my heart rather than my head in order to delve into relationship with the Angels and allow them to begin their work within me. And so I did, and so they did. And once my heart started feeling them do their remarkable work in my life, my curiosity was really piqued. As the Angels opened me up on the inside, I surrendered to what would become years of work with the Divine within, as well as research, study, learning and teaching -- all which has helped to deepen my awareness and my experience further. As the 72 Angels, i.e., light "angles" of the Divine have impressed upon me deeply -- we are not "only human." We are Divine-Human beings, with an inner and an outer composed of both the seen and the unseen, matter and essence, time and eternity. Once we become aware of the Angelic / Divine "program" that is running behind all our human being-and-doing, we begin to realize that there is "more than meets the eye" to everything and everyone in our life. What is so important about awareness is that it has the energetic power to bring that "more" into conscious play and to create tangible and uplifting changes in our experience of life. - brings about transformation. As awareness becomes the consciousness we walk around with -- our emotions, intellect and physicality are transformed, and our experiences of everything and everyone in our lives are enhanced. This is a good and simple place to start in working with the 72 Angels, because it gives you a daily practice and touchstone for awareness. The Angel of the day expresses qualities of Divine Love through the human heart and its capacities for love, compassion, intuition, wisdom and understanding. Our most profound possibilities for transformation at all levels of life occur here, in the heart, which is the broadcaster of our soul being, truth and purposes unto our heart and the the rest of our human parts. Thus the daily Angel supports our specific daily happenings by helping to amplify more heart-and-soul awareness, which give depth and meaning to our day. Since each Angel in its heart-dominion governs five times a year for one day according to its number in the 72-day sequence of Angels, if you practice for a whole year you will journey with all 72 Angels through five different seasons which mirror the seasons of our own lives: Spring, Summer, Fall, Holiday and Winter. - Start your day reading the Daily Wisdom for today's Angel, noticing if there's a particular part of the message that resonates with you. - Notice the 20-minute Intellect Angel when notable events occur, or to get ready for an upcoming meeting or conversation. - Incarnation Plane ~ Expresses qualities of Divine Beingness and Will in human physical beingness and life purpose. Governs one 5-day period in the year. - Heart Plane ~ Expresses qualities of Divine Love in the human heart and the cultivation of love, compassion, intuition, wisdom and our personal heart truth. Governs 5 different days during the year, 1 for each 72-day cycle. - Intellect Plane ~ Expresses qualities of Divine Mind in the human intellect and the cultivation of awareness and higher-mind. Governs for a 20-minute period in the 24-hour day. Working with your personal Birth Angels is the other important opportunity given to you with this tradition to help you know and cultivate more of who you truly are through your unique gifts, help you to fulfill your potentials and purposes, and to heal old hurts and transform your life's challenges into new aliveness and vibrancy. Your three Birth Angels are those which were governing at the date and time of your birth, so that you, and each person, has an Incarnation Angel (also referred to as your Guardian Angel), a Heart Angel and an Intellect Angel.